We have waited Windows 10 with high anticipation, and now we finally have the chance to try it and see all of its new features. However, just like with many other new operating systems, there are always going to be some bugs and issues. One of the more annoying issues is blank screen after Windows 10 update, but luckily there are few solutions that you can try out. When you get greeted with a blank screen this means that you’re stuck on login screen, but luckily you can still log it by following these steps. Wait until mouse cursor appears and you can move it around. Press Ctrl key on your keyboard to position your mouse on the password box. If you accidentally enter a wrong password press Enter again, and type your password again followed by Enter. If you’re installing Windows 10 your cursor shall disappear for a few minutes until the setup is complete, so you might have to wait for several minutes. If this method didn’t get the job done, try with some of the following solutions. If you have managed to get passed the blank screen by following the previous solution you might want to try disabling Fast Startup. Select Choose What the Power Buttons Do on the left side. Select Change Settings That are Currently Unavailable near the top of the screen. Find Fast Startup and disable it. This sounds like an obscure solution, but users have reported that it’s helpful so it’s worth trying out. If you cannot access Windows 10, try accessing by going to Safe Mode. While your computer boots keep pressing F8 or F2 and choose the Safe Mode from the list. If you have a built-in graphic card along with a dedicated one you might want to try disabling your built-in graphics in BIOS. Steps might vary depending on the different versions of BIOS, and if you’re not sure how to do it, ask someone to do it for you. Users report that this issue is caused by faulty driver downloaded by Windows Update, and in order to fix this, you first need to disable automatic update for your display driver, uninstall it and download the latest version. Go to System and Security > System > Advanced System settings. Click the Hardware tab, then go to Device Installation Settings. 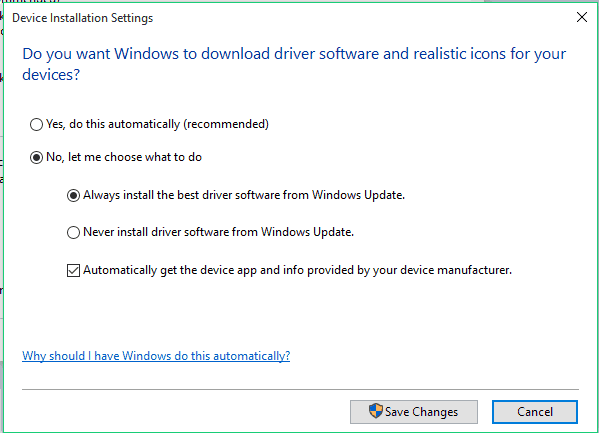 Select No, let me choose what to do and Never install driver software from Windows Update. We have to notice that this might not permanently disable driver updates and users have reported various success rates with this method. In addition, Microsoft has released its Show or hide updates troubleshooter package that allows you to choose what updates and driver updates you want to prevent from downloading. After you’ve done all of this, go to Device Manager find your display drivers and uninstall them. Now you just need to go to the your graphics card manufacturer’s website and download the latest driver and install it. For that, we recommend you this third-party tool (100% safe and tested by us) to automatically download the outdated drivers on your PC. 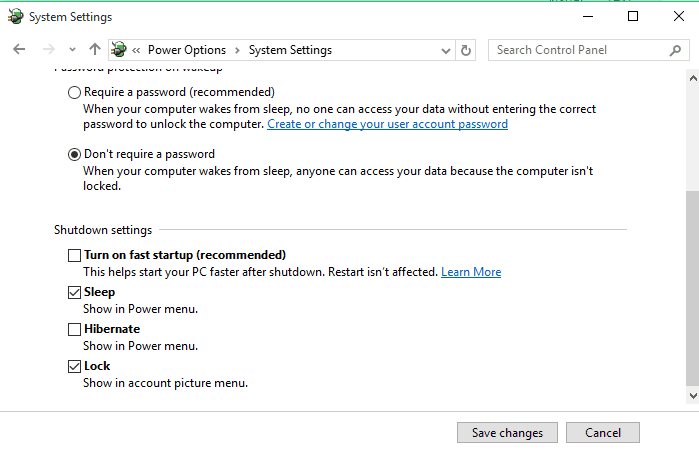 After doing this your custom drivers won’t be overwritten by Windows update, and hopefully this should fix the blank screen issue on Windows 10. That would be all, I hope that at least some of above-mentioned solutions helped you to solve the blank screen problem in Windows 10. If you have any comments, suggestions, or you want to share your experience with blank screen in Windows 10, reach for the comment section, below. 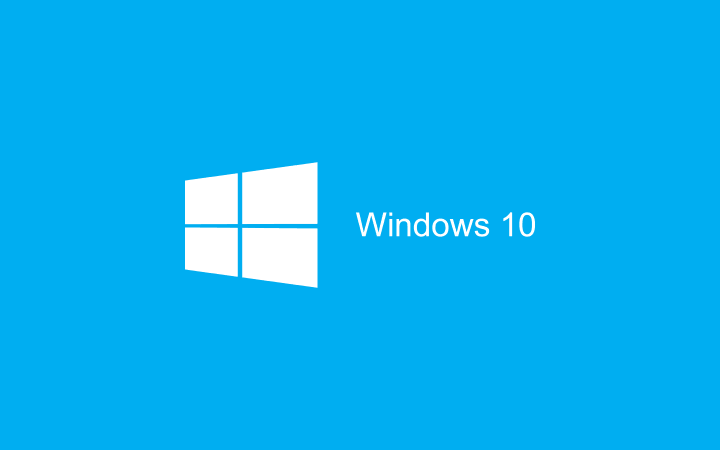 Also, if you have any other Windows 10-related issues you can check for the solution in our Windows 10 Fix section.